Breakfast Projekt: I am an Alfa Female!!! I am an Alfa Female!!! 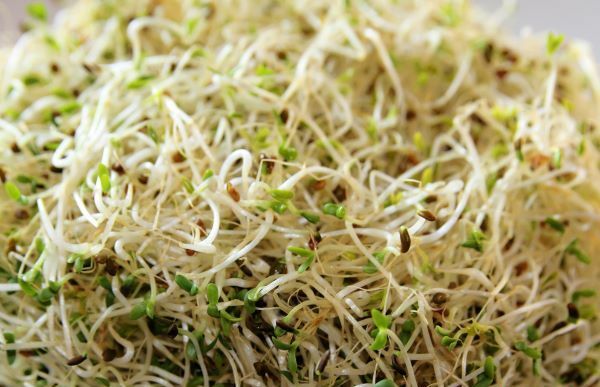 There is something so convenient about Alfalfa Sprouts. 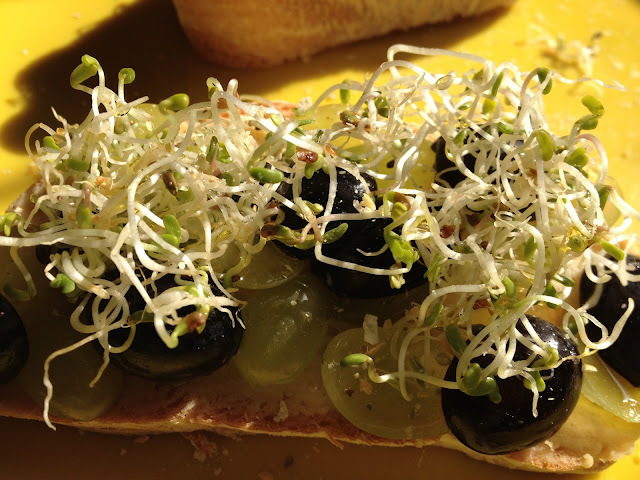 I love their green, juicy texture, and my love for the sprouts has nothing to do with their potent protein content. That's just an added bonus. I had been to the Food Hall at The Palladium yesterday, and picked up some very fresh bread and a bunch of fruits. So today's breakfast was an easy choice. The recipe is so simple that I am not even going to make a "recipe" out of this. Seriously! It's fool proof. Take a generous slice of your preferred bread, and smear some hummus on top. I picked this delicious Lemon and garlic Hummus and we are planning an eternal union, since it was indeed love at first sight. Top the smear with some grapes cut into halves, and drizzle some extra virgin olive oil on top. I also sprinkled some dried, mixed herbs, for an extra element to the Bruschetta. Yes, it's that simple. My experiments with cooking have brought out this fundamental truth about food. It's nothing to be afraid of. Cooking basic food is child's play. It's when you set unrealistic gourmet goals for yourself, or get influenced by the picture perfect meals the rest of the world seems to be flipping out at a breath's notice, that trouble begins. It takes no tears or pain to whip up a quick, healthy meal for yourself and your family. So Stay Calm, and Cook Something Quick and Easy. That's our new mantra.